Circles are fun. Who hasn't enjoyed a game of ring-around-the-rosy in their life at least once, or maybe played with a hoola-hoop. Circles are also yummy, like the doughnuts that my girls and I made last night. Circles are serious too. Teachers like to use them with red ink to emphasis something you did wrong on a test, or to bring attention to the fact that you received a big fat F on same said test, or maybe an A, or a perfectly acceptable C. Circles are also symbolic. Stonehenge is built in a circle and people have been arguing about what these stones represent for many years. Wedding rings are circular and represent the commitment that a man and woman have made to one another. 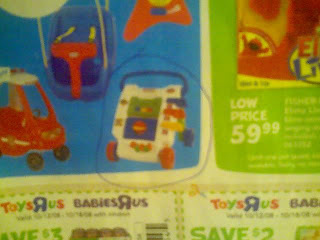 Often though, especially on Sunday afternoons, circles at our house mean that the sale ads have been scoured by the children. They will spend a few hours perusing the sale ads and circling all they would like to have. They want to make sure that Mom knows exactly what they like and think they should be allowed to have. Sometimes I think this circle is a symbol of our greediness and is very ugly to me. Yesterday however was a little different. 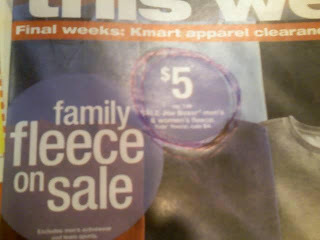 Here is a picture with a very emphatic circle bringing my attention to a great sale on fleece. Well, it did snow yesterday and this child was probably feeling a bit cold, so they wanted me to know I should buy them warm clothes. 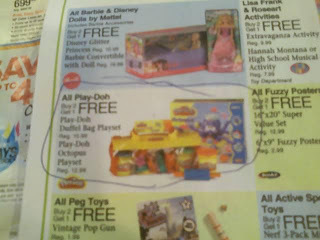 Here is a circle around a play-doh set. Look Mom it's buy one get one free! You can get us twice as much for the same price! At Church the Primary President found out about some families in the Inner City who need some extra help for Christmas. The Primary is going to act as Christmas Angels for these families. Each child has been asked to earn a little money and then purchase something for one of the children or their parents. The children were each given a piece of paper explaining what to do and what items the family was in need of. This dear child of mine had taken this project to heart and was already working out how much she would need to earn to purchase all she wanted to get for them. After circling the sale ads she followed me about asking me to come up with things she could do this week to earn money. "You can clean the kitty litter for a dollar." "No I said a dollar"
"A dollar and a quarter"
You can vacuum the hallway for fifty cents. She looks carefully at the rug "It's really dirty, how about a dollar"
And so it went on. She computed the amount she could earn if she did each chore for a few weeks and pronounced the amount proudly! Then trying to figure out how she could get more she added, "Maybe Grandma will give me some money when I see her later!" *Tears in eyes* These sale paper circles are now beautiful symbols of selflessness. Circles are also said to represent the circle of life. She was once a baby with many needs, who has now grown into a young woman wanting to serve the needs of others.